I had intended to post these butterfly photos prior to our departure on a short holiday but I was too distracted with preparations to concentrate. Now we are back, delighted to be home after a wonderful holiday enjoying many happy family gatherings as well as some good walks and exciting birdwatching in the Brisbane environs. The first photo shows the underside of the wings of Junonia hedonia zelima with its delicate patterns of red and pale blue on a dark background. Quite a contrast to the bright orange topside. It is often seen in swampy areas amongst Melaleuca as well as in garden situations – a bright splash of colour. According to Common & Waterhouse in “Butterflies of Australia” the larvae of this Junonia feed on a small herbaceaous plant called Hygrophila salicifolia, which grows in swampy conditions. In fact this Hygrophila grows in water and is known as an aquarium plant. An alternative host plant for this species is Hemigraphis alternata, a prostrate ornamental plant with purplish leaves – both these plants belong to the family Acanthaceae. 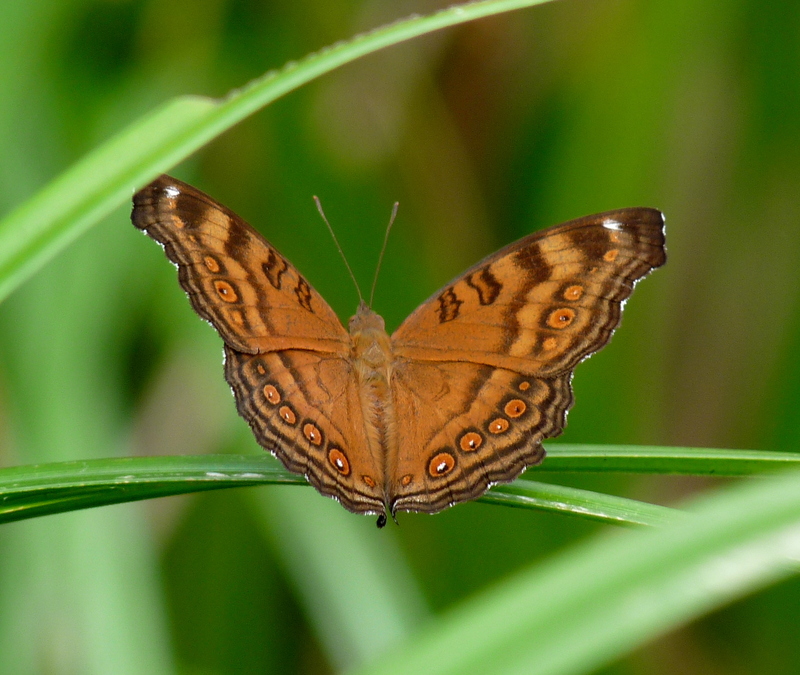 According to Charles McCubbin in “Australian Butterflies” this is one of the butterfly species collected while Endeavour was beached at Cooktown. There is no reference to the origins of the common name – Brown Soldier. This delightful little butterfly is more of a challenge to photograph as it flits around the garden or rainforest showing flashes of electric blue. I have not, as yet, managed to take a photo of the upper side of the wing showing this colour but if you look carefully along the wing you will see a glimpse of it. 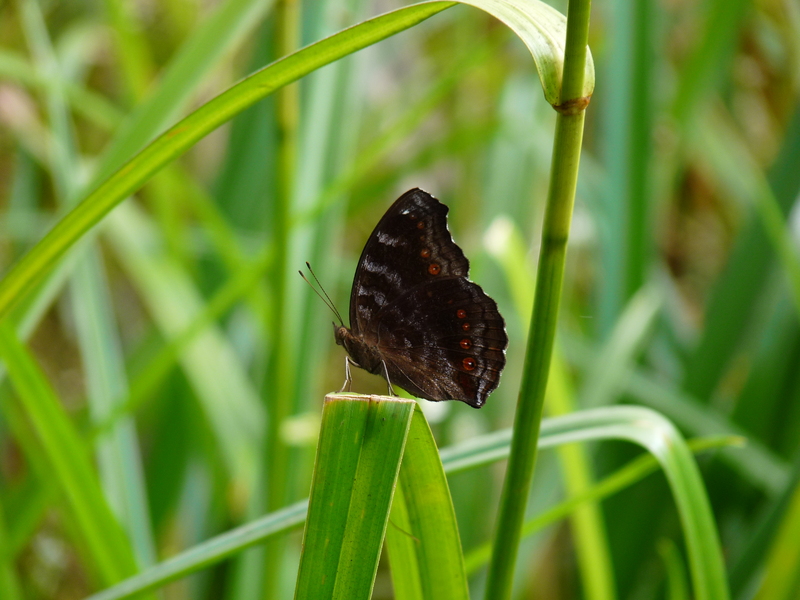 While at rest the butterfly frequently shifts its wings which makes the short curved tails on the hind wings wiggle. 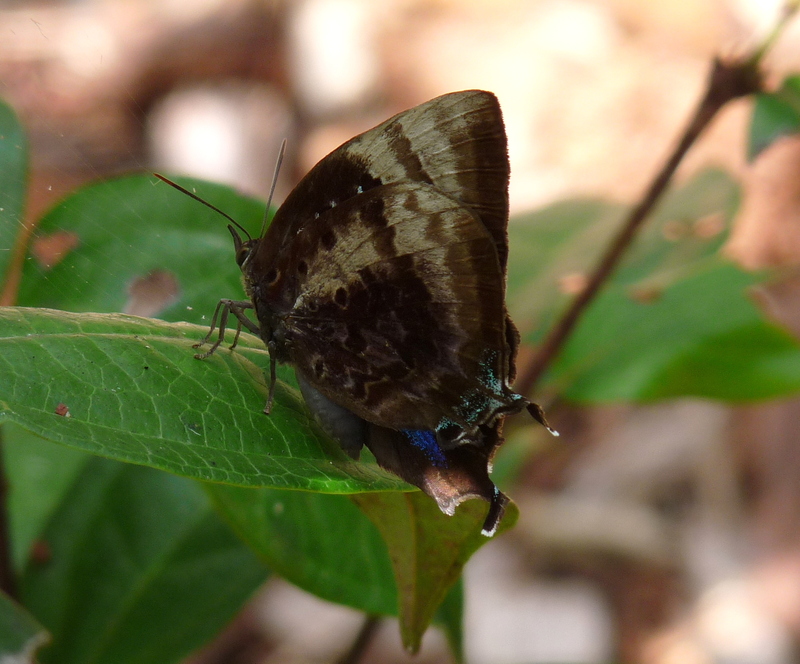 Charles McCubbin observed a significant number of Oakblues with damage to both hindwings which nearly always included the loss of both these tails. He came to the conclusion that the movement of the tails directed predator attack to an expendable portion of the wing membrane. There are several families of native trees on which the larvae have been recorded feeding however, both larvae and pupae of Arhopala micale amphis are always attended by Green Tree Ants. When not feeding the larvae will rest in the shelter of a curled leaf or at the entrance to the ant’s nest. The Common Oakblue sounds like it would be spectacular. I can see the colour.